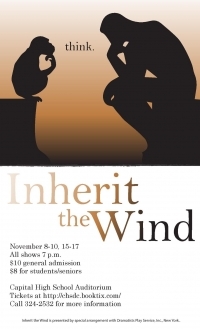 The Capital High and Helena High theatre students are collaborating to bring Inherit the Wind to the stage. This is a play based loosely on the Scopes Monkey Trial of 1924, which centered around a science teacher's right to teach evolution. This play's message trumpets the right to think for oneself, not to sheepishly believe in whatever the masses tell them. It's not so much what one thinks, but that they think at all,after careful thought and deliberation. Our show dates are November 8-10, 15-17, 7 p.m. at the CHS auditorium.